The Jamaica women's bobsleigh team are expected to compete at Pyeongchang 2018 in a sled "donated" by a beer producer. The participation of Jamaica's first women's Winter Olympic bobsleigh team was under threat following the departure of coach Sandra Kiriasis. The former Olympic champion said she used her contacts to secure their previous sled and was "legally responsible" for its use. She was demanding payment in order to allow Jamaica to use it. A Jamaica Bobsleigh and Skeleton Federation (JBSF) spokeswoman said it was "donated" by one of Jamaica's most popular beer producers, Red Stripe. Jazmine Fenlator-Victorian and Carrie Russell are hoping to become the first Jamaican women to compete at the Winter Olympics - 30 years after the Jamaican men, who inspired the film Cool Runnings, made history in Calgary. It is the latest twist in a long-running saga regarding the equipment used by the women's bobsleigh team following the declaration by a Japanese manufacturer that they were considering taking legal action against the JBSF. 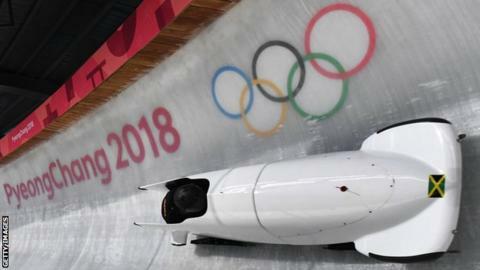 The Tokyo-based company claim to have had an agreement in place, whereby they created a bobsleigh for the team free of charge in exchange for it being used during the Olympics. However, it is understood that, although the Jamaicans used the sled earlier in the season, they were forced to borrow another - via Kiriasis' contacts - after the manufacturer failed to deliver the craft to Europe in time for the second phase of the World Cup. Using the replacement, they finished seventh at the Winterberg World Cup in Germany in December. The best finish for a Jamaica team at an Olympics is 14th, by the men's four-man line-up at Lillehammer 1994. The Jamaica team can use any sled in training but the race sled will have to be checked by the IBSF jury and be given an Olympic stamp. It's hardly ideal preparation because if it is a new sled, Fenlator-Victorian will not have a lot of time to get used to the sled, she may not have a feel for it, and that can play on the dynamics of the team and the confidence. In official training they have to put down two clean runs - by that I mean not crash - to be eligible to race in the Olympics. The situation is a mess and it is like Cool Runnings, but 30 years on you would expect Jamaica Bobsleigh to be better than this.